Miami is the gateway between the United States, Latin America, Europe, and Asia. Many American, European and Asian companies have their Latin American regional headquarters here. Moreover, Miami is home to one of the world's largest privately owned and operated free trade zones, has the third largest U.S. airport for international passengers and is the cruise capital of the world. Miami also has the second-largest number of foreign banks in the United States, a large representation of foreign consulates, 25 international trade offices, 40 binational chambers of commerce and many non-governmental organizations with headquarters or offices here. 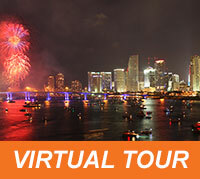 Take a virtual tour icon to read more about living in Miami for law school. Since the 1950s, Miami Law has offered LL.M. programs for foreign-trained lawyers making it one of the most established LL.M. programs in the U.S. This gives students access to the real expertise and knowledge of staff. LL.M. programs at Miami Law have always been small and selective to provide a superior experience for both students and faculty. The LL.M. Programs are tailor-made to each student's academic and professional needs. Each LL.M. student creates a course of study that matches his or her career goals. 3) Large Number of Students Who Prepare to Take U.S. Bar Exam and/or Stay to Do the J.D. - They have other LL.M. students who move on with them from the LL.M. to do the J.D. and this creates a supportive group of classmates. - Miami Law has a special “LL.M./J.D. Academic Advisor” – Yasmina Assis – who meets with students and advises them on everything from transferring to the J.D., to choosing the necessary courses to be able to take their desired U.S. Bar Exam. - International students are comfortable here - being foreign is an advantage with job opportunities in the area. The Career Development Office (CDO) is staffed with nine professional counselors (all of whom are former practicing attorneys). This includes an experienced career advisor exclusively dedicated to foreign-trained law students (pictured advisor Yazmyne Eterovic). The law school also provides career guides specifically for foreign-trained attorneys. The University of Miami School of Law offers extensive courses in each of the major areas of international and foreign law including courses in Spanish. These courses are intended for law students who are trying to improve their knowledge of technical Spanish.The University of Miami School of Law has one of the largest faculties who teach or do scholarly research in the area of international and foreign law of any American law school. - In 2018, The International Jurist named Miami Law as one of the “hot spots for international law…and a destination for aspiring international lawyers” in its look at 25 top schools for foreign lawyers. - The Financial Times - in 2015 and 2016 ranked Miami Law as one of the most innovative law schools in the world. - LLM-Guide.com - ranks Miami Law as the 15th most popular law school in the U.S. and our preparation in Sports Law in our Entertainment, Arts and Sports Law LL.M. as one of the best in the world. - Cambridge University - included Miami Law as a "Leader in Learning" and one of the most innovative law school's in its recent publication Innovation 800. - Billboard Magazine - ranked Miami Law in 2017 as a top school for music law the U.S.
- Hispanic Business Magazine - selected the University of Miami School of Law as one of the top ten U.S. law schools for Hispanics for seven consecutive years. - Pre-Law Magazine - ranked Miami Law as having one of the best moot court programs of the decade out of all 200 U.S. law schools and in 2018 ranked Miami Law as a top three law school for Hispanic students. - National Law Journal, the National Jurist and the Daily Business Review - ranked University of Miami Law highly for associate promotions to partner at law firms. - National Jurist Magazine - ranked Miami Law #3 best school for Hispanic students in Spring 2018. The flavor of Miami is well reflected in the school and foreign students have an easy time belonging and being part of the campus and larger community. In a typical year, Miami Law’s international graduate law programs includes about 40 students from 20 or more different countries around the globe, and the law school has graduated over 23,000 alumni who are living and working in more than 90 countries around the world. In 2018 PreLaw Magazine ranked Miami Law as a top three law school for Hispanic students. In addition, the School of Law was cited by Hispanic Business Magazine as a place that promotes and encourages a diverse community where Hispanic students can thrive. In 2014 Hispanic Business Magazine ranked the University of Miami School of Law a top three law school in the United States for Hispanic students based upon its strong international business curriculum with a particular focus on Latin America. Miami Law faculty and staff can relate to international students from the inside out. This is because a number of people who first came to the U.S. as International Students now work at Miami Law. This includes Carmen Perez-Llorca, Director of International Graduate Law Programs; Yasmina Assis, Associate Director of International Graduate Law Programs and LL.M./J.D. Academic Advisor; Paula Arias, Director of International Moot Court Program; Sandra Friedrich, Director of the White & Case International Arbitration LL.M. Program; and Yazmyne Vasquez Eterovic, Associate Director of Career Development and Career Advisor for International LL.M. Students. Some of LL.M students are selected to serve as research assistants to international Faculty during the academic year. The University of Miami School of Law is home to one of the largest legal research libraries in the Southeast United States with an impressive international law collection. The foreign and comparative collection has extensive English, European Union and Latin American materials, including what is generally regarded as the best collection of materials on the Caribbean anywhere. The library has a specific Foreign/International Law Librarian - Bianca Anderson (pictured) - available to assist students with research.